Focus on the promises of God to overcome the voices of insecurity, fear, condemnation, and discouragement…. This guide will help you and your small group replace negative internal chatter with the promises of God. Join Pastor Steven Furtick as he walks you and your group through the issues of insecurity, fear, condemnation, and discouragement, and learn as he offers strategies for combating them. Designed for both individuals and groups for use with the companion DVD, which consists of six video sessions. A leader's help guide makes it easy for any group member to conduct the group study of Crash the Chatterbox. The questions and reflections in this guide will help you see for yourself why listening to God's voice above all others is the most important habit you can ever develop. 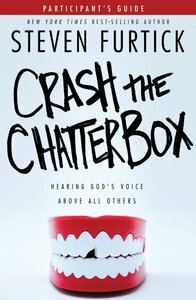 About "Crash the Chatterbox (Participant's Guide)"